As I have written about before, I love making food for Adalyn. I love watching her try new foods. I love her eating nutritious foods that I love. She is a pretty good eater which makes mealtimes more fun. When it comes to making lunch for Adalyn (or dinner), we focus on giving her vegetables, some kind of grain and protein. This can vary quite a bit depending on what we are eating. She mostly eats what we are eating unless we are eating something too crunchy, spicy or salty. It is so nice to be able to give her what we are eating as opposed to making her separate meals all the time. Before I became a parent, I decided that I was not going to be a short order cook when I had kids and so far, I am sticking to that. My parents had us eating everything growing up and now I am a great eater so I plan to do the same with my kids. Sorry, kool-aid, cheetos and lunchables are not what you're having for lunch kid (although I think that these foods can be okay on occasion)! As you can see, we try to stick to healthy options avoiding added salt and sugar. We try to steer clear of many processed foods and give her the most nutritious meals that we can. I do not plan to ever restrict her from eating foods that are less healthy. At a party, she can have cake and ice cream for example but most days, we will try to provide her with nutritious foods to support growing healthy and strong. Adalyn always feeds herself. There is no feeding her! If we try, she cries and screams until we give her the food to feed herself. As you can imagine, this can get pretty darn messy! Therefore, we always keep wipes nearby the highchair so that we can wipe her down right when she is done eating. Wet Ones has an awesome contest going on right now where you can upload a picture of your child's lunch for win $1000 and a year's supply of Wet Ones for home and your child's classroom! See site for terms and conditions. 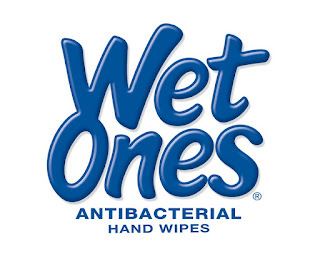 Wet Ones antibacterial hand wipes help clean up sticky hands. They kill 99.99% of bacteria. These come individually wrapped and are the best to have in our diaper bag to clean up our messy girl when we are out and about. They contain aloe and will not irritate skin. They come in fresh scent and citrus scents. Check out the Wet Ones site to enter for yourself to win! Disclosure: This is a sponsored post by Wet Ones. All opinions are my own.